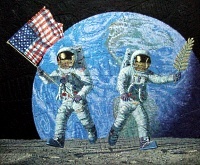 There are but a handful of original paintings available in Alan Bean's Private Collection. Submit the form below for further information. 16 1/8" x 19 3/4"
Jack at 167:07:20: "Too bad I don't have my skis". Jack at 167:07:39: "Shhh...Shhh...Shhh...Whoo!... Can't keep my edges...Shhhh...Shhhoomp...Little hard to get a good hip rotation". 30 1/8" x 19 7/8"